"Beat up everyone in your office to win a promotion!" 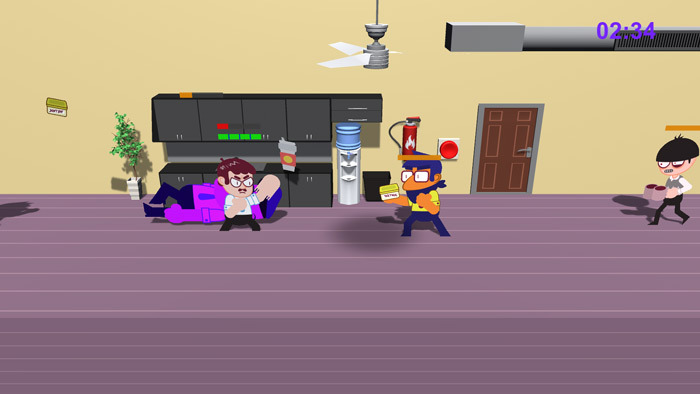 Minimum Wrage is a side scrolling beat ‘em up game set within the confines of an office, you play as a downtrodden blue collar worker who when offered the chance of a promotion by the human resources officer (which is being awarded to whoever can reach his office first of all) and after he has ordered you to clean all the coffee pots with your tongue, you take it upon yourself to be the first one in to that office. It won’t all be plain sailing though as you have to beat your way past co-workers, security guards and anyone else you may run in to whilst making your way through the office halls, if using a controller (which is highly recommended) you will be taught all sorts of special moves for dealing with the attacks and fighting multiple people at the same time. The game ends with a literal “Boss” fight where you must fight your boss in his office to finally receive your promotion and no longer have to clean coffee pots with your tongue! The game looks good in its bright and colorful style although the fight sequences can become a little bit repetitive it is nice to play a side scrolling beat ‘em up and co-op mode is available too if you want to play with a friend. 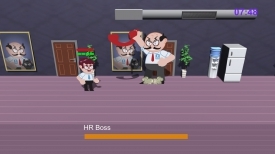 Overall it’s a pretty fun game and if you have ever felt like going on a rampage through your office then you will be able to live out that fantasy with Minimum Wrage. You can download Minimum Wrage here for free.